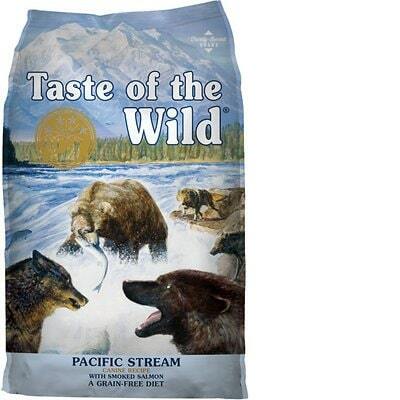 Taste of the Wild Pacific Stream Grain-Free is a low-priced dog food with average quality. This product has 1 controversial ingredient, but no artificial colors, flavors or preservatives. It has a high amount of carbs, compared to its protein and fat, and the meat and fat quality in the food is mixed. Taste of the Wild has a below-average number of dog food recalls and was exceptionally open and transparent when answering our questions. The food has high carbs and somewhat low protein and fat, making it less nutritionally balanced compared to other dog foods we evaluated. Carbohydrates are cheap so they keep the food’s cost low and they are nutritionally useful to dogs in the right amounts. However, very high amounts of carbs can reduce the much-needed meat-based protein and fat content. Salmon, Ocean Fish Meal, Sweet Potatoes, Potatoes, Peas, Canola Oil, Lentils, Salmon Meal, Smoked Salmon, Potato Fiber, Natural Flavor, Salt, Choline Chloride, Taurine, Dried Chicory Root, Tomatoes, Blueberries, Raspberries, Yucca Schidigera Extract, Dried Lactobacillus Plantarum Fermentation Product, Dried Bacillus Subtilis Fermentation Product, Dried Lactobacillus Acidophilus Fermentation Product, Dried Enterococcus Faecium Fermentation Product, Dried Bifidobacterium Animalis Fermentation Product, Vitamin E Supplement, Iron Proteinate, Zinc Proteinate, Copper Proteinate, Ferrous Sulfate, Zinc Sulfate, Copper sulfate, Potassium Iodide, Thiamine Mononitrate (Vitamin B1), Manganese Proteinate, Manganous Oxide, Ascorbic Acid, Vitamin A Supplement, Biotin, Niacin, Calcium Pantothenate, Manganese Sulfate, Sodium Selenite, Pyridoxine Hydrochloride (Vitamin B6), Vitamin B12 Supplement, RiboflAvin (Vitamin B2), Vitamin D Supplement, Folic Acid. The average dog food we reviewed has 39 total ingredients, with 1 controversial ingredient. This product has 1 controversial ingredient. Salmon offers one of the highest Omega-3 contents of any type of fish. Raw meat contains about 75% water which is cooked off during the making of dog food. This leaves only a fraction of the protein content in the final product's weight. We recommend looking for dog foods that also include meat meals in the first five ingredients (pre-cooked meat powder that contains four times the amount of protein). Salmon is generally a healthy dog food ingredient. This product is made in the United States, ensuring high standards for food safety and overall quality. In short, this is a very good thing. We generally recommend dog foods made in the USA, Canada, New Zealand, Australia and Europe for that reason. This food includes Salmon, Ocean Fish Meal, Canola Oil, Lentils, Salmon Meal, and Smoked Salmon as the major protein and fat sources.All of them are very transparent, except for Ocean Fish Meal - which fish does this come from? You can’t be sure. 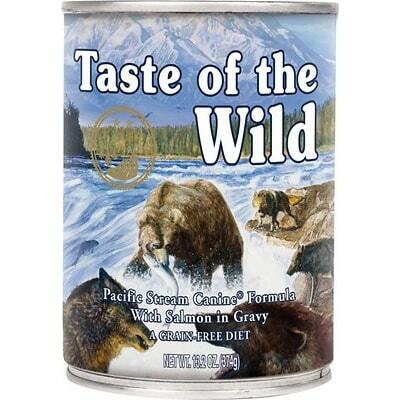 Taste of the Wild Pacific Stream Grain-Free contains 0 controversial artificial preservatives. It’s good to know that ‍not all artificial preservatives are bad. That’s because they serve an important purpose, which is to prevent food from spoiling. However, we consider 11 artificial preservatives controversial because of their potential link to cancer and other serious health conditions. No artificial colors, either. Absolutely excellent! Last but not least, this product manages to shine by alos not using any artificial flavors. No artificial preservatives, colors or flavors is exactly what you want to look for in dog food. Well done! 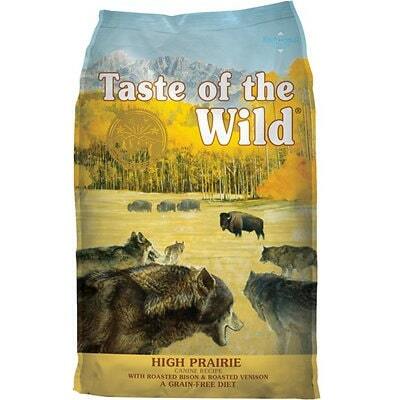 Taste of the Wild has a below-average number of FDA recalls. Taste of the Wild Wetlands Canine with Roasted Fowl, Net Wt. 30 lbs, Taste of the Wild Pet Food, Rt B, Meta, Missouri 65058. Taste of the Wild High Prairie Puppy with Roasted Venison & Bison, Net Wt. 30 lbs, Taste of the Wild Pet Food, Rt B, Meta, Missouri 65058. Taste of the Wild High Prairie Canine with Roasted Bison & Roasted Venison, Net Wt. 30 lbs, Taste of the Wild Pet Food, Rt B, Meta, Missouri 65058. Taste of the Wild Pacific Stream Canine with Smoked Salmon, Net Wt. 30 lbs, Taste of the Wild Pet Food, Rt B, Meta, Missouri 65058. Taste of the Wild Sierra Mountain Canine with Roasted Lamb, Net Wt. 30 lbs, Taste of the Wild Pet Food, Rt B, Meta, Missouri 65058. Taste of the Wild Pacific Stream Puppy with Smoked Salmon, Net Wt. 15 lbs, Taste of the Wild Pet Food, Rt B, Meta, Missouri 65058. Approx. 10,275,000 lbs total (for all Taste of the Wild brand products). Taste of the Wild was exceptionally responsive to our first email. They also responded quickly to the follow-up email sent to clarify a few of their answers. They received a perfect transparency score. Answers to the questions are below. We use a team approach for veterinary and pet nutrition. The team is comprised of staff members as well as outside consultants. Dr. Alexia Heldman is the staff veterinarian while Dr. Melissa Brookshire and her veterinary team provide regular consultation. In addition, Dr. George Fahey, a prominent nutritionist, provides nutritional consultation on an ongoing basis. Mark Brinkmann has been formulating recipes for Diamond Pet Foods since 1995, and trained under Mark Morris, the founder of Hill's Science Diet. We utilize a 3rd party, certified laboratory to make sure our foods are well accepted by the pet, and nutritionally adequate. These tests are non-invasive. The work is conducted by registered technicians and supervised by licensed veterinarians. Finding the right balance is the key, just as it is with many decisions we all face. We hold ourselves accountable to find the proper balance between minimal animal testing, and food safety assurance. All of our diets are formulated to meet the nutritional levels established by the AAFCO for either all life stages or maintenance. This statement is printed on each and every bag. This is a wonderfully transparent answer. They articulated a belief we found was shared by other manufacturers. 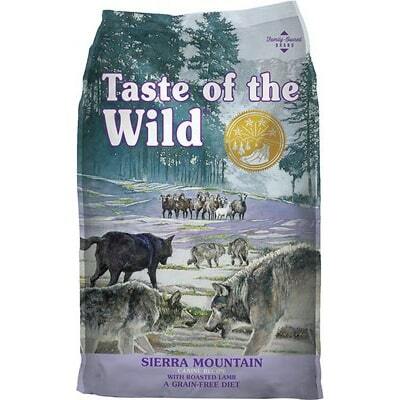 Taste of the Wild, a Diamond Pet Foods brand, is manufactured here in the U.S. in facilities wholly owned by Diamond. We are committed to product safety and quality, and adhere to stringent food safety protocols. We constantly monitor and test our raw materials, production environment, processes and finished products. We've developed a comprehensive food safety system as outlined below. Food safety is our #1 priority and it shows in the amount of new business we get from word of mouth—friends and neighbors talking to one another, recommending our foods. Please visit our corporate website, http://diamondpetcompany.com/#facilities/1 for a virtual tour of our facilities to get an inside look at what it takes to create high quality pet food. 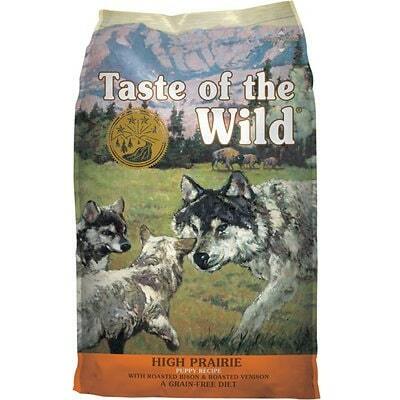 Taste of the Wild, a Diamond Pet Foods brand, is manufactured here in the U.S. in facilities wholly owned by Diamond. This is another example of Taste of the Wild giving much more complete answers, that include belief statements which we feel is a transparent way of communicating to consumers. While the content or claims could be contested, it is very transparent.